Incentive and reward programs are supposed to help motivate people to perform at a high level. The idea is to acknowledge and reward the hard work that helps your organization reach its strategic goals. But some programs reduce all that to Work Skee-Ball: win as many points (tickets) as you can, and hope you score a decent prize. It’s not that points-based employee incentive programs are inherently bad or ineffective—and we’re not knocking skee-ball! But the fuzzy math used to compare arcade rewards (how many tickets for the stuffed animal?) can cause real problems when employees lose the connection between their actions and results. As an employer, that’s one of the potential pitfalls you’ll need to avoid. Here’s a quick look at this and other pitfalls to avoid in points-based employee incentive programs. At best, employees hoard points long enough to redeem them for something memorable. At worst, the whole program is met with a reluctant shrug and some awkward head nods. The risk with a long-running program is that the precise path leading to the reward can be unclear, making the reward less effective at motivating colleagues who see someone’s shiny new gear at work. The risk here is wasted time and money. Clicking Order isn’t the same as public recognition by the boss’s boss. This isn’t just about giving employees warm fuzzies, either. Recognition is most effective when it’s public and originates from ownership or senior management. If your program isn’t properly structured and administered, it can create new headaches. If some managers award more points than others, then employees in different divisions don’t receive the same chance to succeed, which can be perceived as unfair. Depending on how your program is set up, employees may even cheat (it happens). Programs that aren’t completely clear about which behaviors yield which rewards are confusing. Avoid this pitfall by tying specific actions (metrics-based achievements) to specific recognition and rewards. Everyone in the company should know exactly what it takes to win and what steps they need to take to stand a chance of earning a reward. For employers, the biggest potential pitfall associated with points-based employee incentive and rewards programs is financial liability. If you don’t pay for your points in advance, they could be redeemed at any time. You can’t budget for that. Although you can put a Use By date on points, that can make them seem less valuable than something redeemable at leisure over the long term. If you’re responsible about your budget and pay for points in advance, there’s another pitfall to consider: some points may never be redeemed, like gift cards. That means you’re not getting the full benefit of your investment. There are plenty of other rewards pitfalls to avoid. In the world of employee incentives and rewards programs, a lot can go wrong. If your rewards program is fueled mainly by inertia, managed like an obligation, or out of sync with your current needs, you could end up making your people feel less appreciated, which is counterproductive. Help your organization realize its overall strategy. 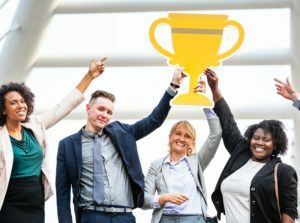 The best way to avoid reward program pitfalls is with an incentive program that couples public recognition of specific employee achievements with rewards that say “you’re appreciated and we value your contributions.” If you’re an ace at design, management, and fulfillment of alternative compensation programs, you already know how to make that happen. If not, we should talk. Inproma creates reward and recognition programs tied to specific metrics, tailored to help your organization hit its strategic goals. Let us know your goals, and we’ll help you meet them.